I’m not sure when Taco Tuesday became such a cultural phenomena. My earliest memory of it is back in my early 20’s when I first moved to San Francisco. I was living in the Marina District (well, technically it was Cow Hollow and I made sure to tell everyone Cow Hollow because God forbid I live in the Marina) and just one block up from where I was living was a bar that celebrated the now infamous Taco Tuesday. In case you’re wondering, it was the Blue Light. I don’t know that anyone actually went there for the $1 tacos so much as they went there for discounted drinks but as the night wore on I’m pretty sure everyone was happy for the $1 tacos. I remember thinking that the tacos were absolutely delicious but wisdom and hindsight has me questioning that as I’m pretty sure anything tastes amazing after several margaritas. 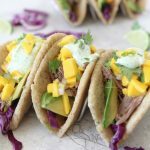 Over the years I’ve definitely upped my taco standards and I’m pleased to say THESE tacos will bring you so much joy… even without a few margs ahead of time. If you pressed me to decide which component was my favorite, I really couldn’t tell you. I’m pretty sure I NAILED the pork and the flavor is completely spot on. In fact, I’d enter it into a competition and feel really good about winning. 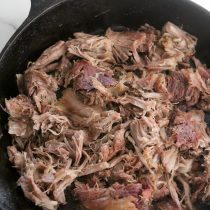 So if anyone knows of a slow cooked pork contest I can join, please feel free to pass along the information, lol. In terms of cooking the pork, I used my InstantPot which I looooove. I set it to about 1 hour and 30 minutes to get the pork super, extra, fall apart-y. But I also know that not everybody has an InstantPot. Fortunately you can use any pressure cooker or slow cooker that you’d like. I also know that everyone has a different slow cooker and each have different settings etc. so you are going to have to go based on what you have and by the manufacture’s instructions because it would be impossible for me to list off every way. Essentially, you are going to want to use the ingredients I listed below and slow cook the heck out of your pork any way you’d like. Got it? Great! Ok, so the pork is delicious. Check. The mango salsa is the perfect pop of summer and tang to contrast the other flavors. I didn’t add a ton of jalapeño to it so feel free to add more if you’d like. I always have a hard time gauging how much spice to add to dishes because I know everyone has different preferences. Personally, I love me some spicy but I know that’s not everyone’s thing. Luckily it’s an easy adjustment for you. Now let’s talk about the cilantro-lime crema. Talk about bringing the dish together. The cool creaminess of it pairs perfectly against the saltiness of the pork and the tart of the mango. To get the recipe for the Homemade Olive Oil Mayo head over HERE. You won’t regret it. I also had some leftover that I ended up thinning out with a bit of almond milk to make a dressing and that was equally as delicious. And finally to the taco itself. While I still have some bits of corn in my diet I avoid it when I can because my stomach doesn’t end up too happy at the end of it all. 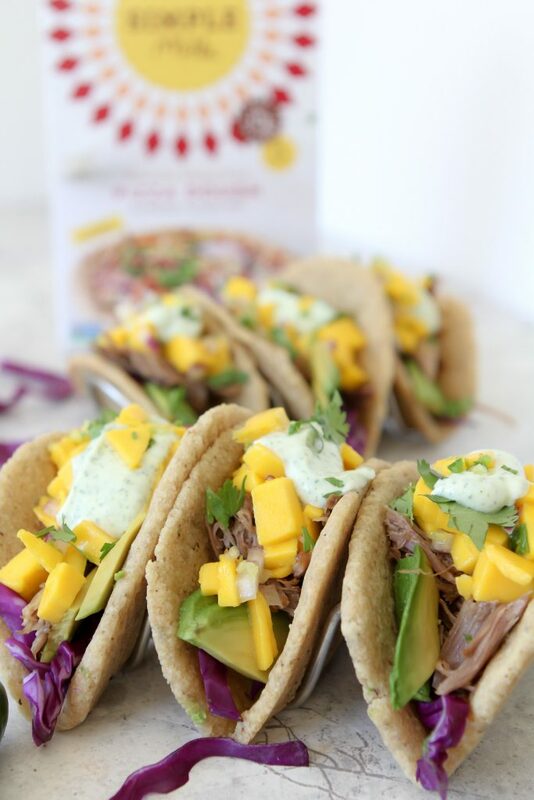 So I got a little clever this time around and used Simple Mills Pizza Dough Mix to form some soft taco shells and am SO happy with the results. First off, the texture and consistency was perfect. I’ve made paleo / grain-free taco shells or wraps before but they’re never sturdy enough to actually hold the taco in place. Honestly, I usually end up turning them into a lettuce wrap instead after much frustration. But not with the Simple Mills mix, I was able to eat this taco with proper taco eating form. Whaddaya know! Besides being able to actually keep this taco held together, the taste of the shells was just amazing with the rest of the ingredients. 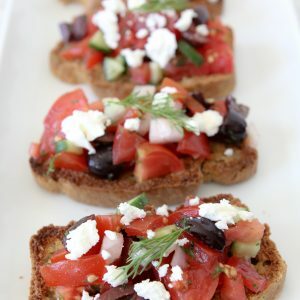 I’m loving how easy Simple Mills makes recipes like this. You can find their products at Whole Foods, Target, natural food grocers or on their website HERE. Have you decided that you need this taco in your life yet?? Good! 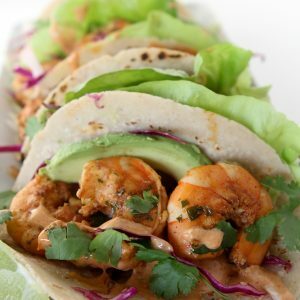 Enjoy the recipe below and happy taco Tuesday-ing. 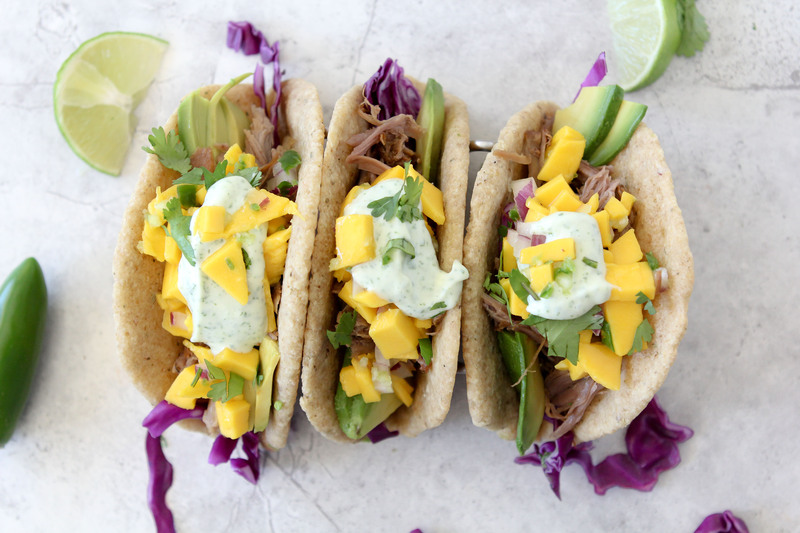 A flavorful pork taco with mango salsa and cilantro cream. Paleo friendly, gluten and grain free. 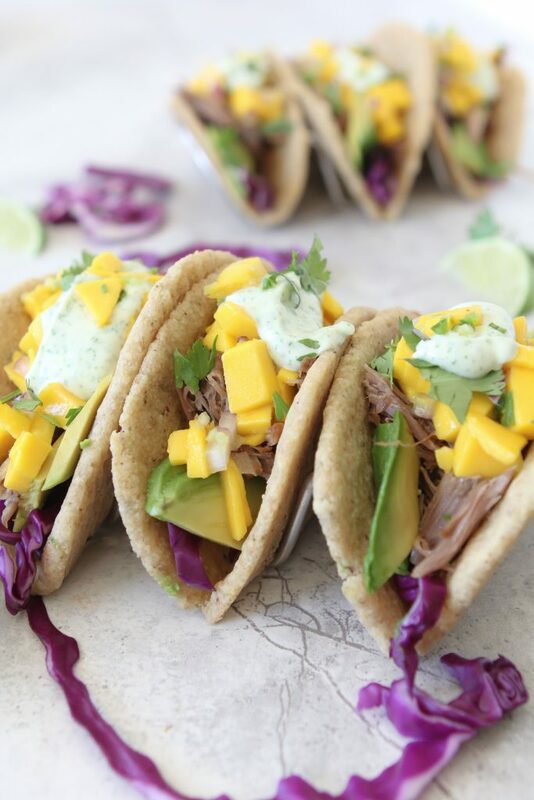 To prepare tacos layer some red cabbage, avocado slices, pork, mango salsa, cilantro crema on top of prepared taco "shells"
Fold your taco up and get your grub on!